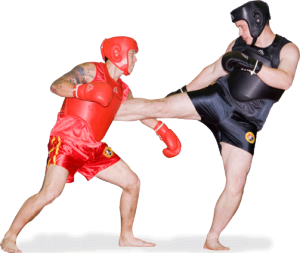 San Shou is a Chinese hand-to-hand self-defense system and combat sport. Not seen as a style itself, rather it is considered as just one of the two components of Chinese martial arts training and is often taught alongside with taolu (forms) training. As a sport, san shao is practiced in tournaments and is normally held alongside taolu events in wushu competition. For safety reasons, some techniques from the self-defense form such as elbow strikes, chokes, and joint locks, are not allowed during tournaments. Competitors can win by knockout or points which are earned by landing strikes to the body or head, throwing an opponent, or when competition is held on a raised platform, pushing them off the platform. Fighters are only allowed to clinch for a few seconds. If the clinch is not broken by the fighters, and if neither succeeds in throwing his opponent within the time limit, the referee will break the clinch.